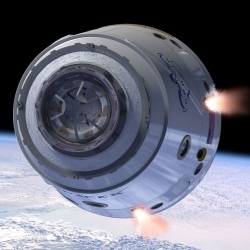 The American SpaceX company’s Dragon cargo capsule has splashed down in the ocean off the California coast. The return to Earth completes a historic first mission to the International Space Station (ISS) by a privately operated vehicle. Impact with the water was confirmed at 08:42 Pacific Daylight Time (15:42 GMT; 16:42 BST). Fast boats positioned in the splashdown zone were despatched to recover the unmanned capsule. Dragon came down right on top of its targeted location about 900km (560 miles) from the Baja Peninsula. "It’s a fantastic day," said Elon Musk, SpaceX CEO and chief designer. "I’m just overwhelmed with joy." The mission was intended as a demonstration of the freight service SpaceX plans to run to the platform. It took half a tonne of food and supplies up to the ISS astronauts, and brought down about two-thirds of a tonne of completed experiments and redundant equipment. A successful recovery of the capsule and its contents will trigger a $1.6bn (£1bn; 1.3bn-euro) contract with the US space agency (Nasa) for 12 further re-supply trips. "I don’t think it’s going to take us very long to make the determination that this was an extremely successful mission, and they should be well on their way to starting services," commented Alan Lindenmoyer, who leads Nasa’s Commercial Orbital Transportation Services (Cots) programme. Dragon’s fall to Earth was overseen by controllers at SpaceX’s headquarters in Hawthorne, California, and at Nasa’s Johnson Space Center in Houston, Texas. The journey home began early on Thursday when the vessel was unberthed from the ISS by the station’s 17.5m (58ft) robotic arm. Astronaut Don Pettit, at the controls of the Canadarm2, then released the cargo ship to fly free at 09:49 GMT, just as the station was moving over the Southern Ocean. Dragon fired its thrusters three times to take itself down and away from the platform. A final 10-minute burn some five hours later committed the capsule to a plunge into the atmosphere. A range of ships and planes had been organised to track the return, which was slowed in the final minutes by three parachutes. A distant camera catches sight of Dragon descending to the Pacific Ocean Once recovered, Dragon will be returned to port, and then transferred to Texas for inspection and for its cargo to be unloaded. Nasa has engaged SpaceX (Space Exploration Technologies Corporation) and another company, Orbital Sciences Corporation of Virginia, to fulfil logistics roles at the ISS. The agency hopes the contracting out of freight duties will save it money that can then be re-invested in more daring activities beyond the station, at destinations such as asteroids and Mars. The commercial cargo approach will be followed later this decade by crew transport services. SpaceX wants this business as well, and is developing the safety and life-support equipment that would allow Dragon to double up as an astronaut taxi. "We want to make sure the vehicle is proven many times over before we put people onboard," explained Mr Musk. "And we want also to add things like escape thrusters to get away from the launch vehicle in a worst case scenario."